Stress is something that most everyone is currently experiencing or has experienced at one time in his or her lives. Stress can come from anywhere and can include work environments, family, personal relationships, money issues or even illness. When dealing with stress, most people admit that they could use help with stress management in their life. People’s reaction to stress can be variable and there are many different symptoms including emotional upset, inability to focus or concentrate, breathing problems, insomnia, anxiety, depression, heart palpations, etc. It can be very easy for people to rely on food, alcohol and drugs to help them handle their stress. Luckily, however there are natural ways to manage or control the stress in your life. These ways include improving one’s diet by limiting the amount of sugar intake, alcohol and caffeine, which does go a long way in managing personal stress. Eating protein every 2 hours not only controls your blood sugar levels but helps to relieve stress in the body. Other natural ways include exercising, acupuncture, meditation, yoga, counseling, talking to friends, breathing exercises, or if possible, simply removing the stress from the person’s life. The list goes on and on. Medicinal plants are an effective way to deal with stress. Some of the leaders in combating stress include St. John’s Wort, Chamomile, Valerian root and Kava Kava. St. John’s Wort is a well-known herbal remedy for stress, anxiety and depression. It has been around for centuries and was widely used during the Renaissance and Victorian periods to relieve mental conditions. One recent study found it was as effective as Prozac for treating depression. St. John’s Wort has also been used to treat viral infections, nerve afflictions and gastrointestinal ailments. Chamomile and Valerian root have been used to help calm nerves and resolve insomnia to promote a good night’s sleep. 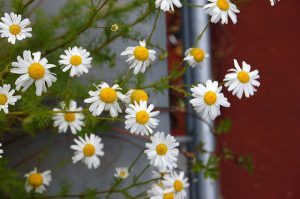 Chamomile has been used to ease both the mind and stomach. It is a popular choice to treat stress in children. Valerian root is an effective sedative but also used to reduce mental and physical tension. Valerian is often found in stress relief and sleep formulas and is also a common ingredient in many menopausal formulations. Kava Kava has been extensively researched for stress, anxiety and insomnia; however, Kava Kava has side effects and needs to be used under the supervision of a health care provider. Other medicinal plants to mention that have been used to treat stress include Lavender, Passion Flower, Hops, Ashwagandha, Skullcap, Licorice, Panax Ginseng and Siberian Ginseng. There are many other natural ways to reduce stress. When dealing with stress, taking charge of your thoughts, emotions and dealing with the problem is essential before considering natural and/or conventional treatments.